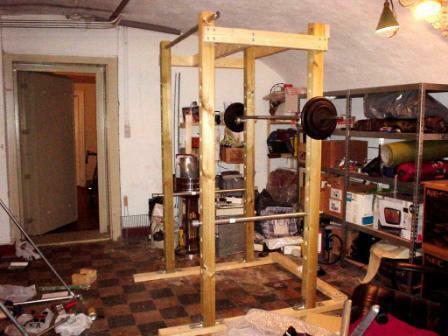 Many years ago, I was searching for designs or plans that would allow me to build a homemade squat rack. After building myself a couple of wooden squat stands, I was hoping to build safety squat racks for self-spotting weightlifting exercises. Some of the designs I saw on the internet ranged back then that were successfully implemented were a combination of wood and metal and had the theme of a squat cage. The pillars or posts for the cage were essentially made of 4" x 4" wood and had squat safety pins made of metal rods. That was the basic idea. Above is an example of a homemade squat cage that is solidly built. As it resembled primarily a squat cage, the typical fully assembled equipment naturally took up space, horizontally AND vertically. Some are fixed or bolted to the ground and/or ceiling or joists, and so this apparatus was virtually permanent and immovable. I suppose it would lend to that because huge pieces of 4" x 4" pieces of lumber aren't easy to disassemble, lug around and store away. In other words, it just wasn't easy to reclaim space should you require it. And for me, space is a premium, as I don't have a big house. I can't imagine giving up garage space (around 5 feet square or more) permanently for a squat cage. What happens when you're in a hiatus? or sick? or recovering from an injury? I guess for that long period of time, you could turn it into a clothes hanger of some sort. For any exercise that you will do with squat racks, or squat cage for that matter, you will be using a barbell. Barbells, you can store away easily. Just remove the barbell weight plates and you're left with an empty barbell that you can lift, carry and lean on the wall so it's out of the way. Now, if I can do the same for squat racks (lift and store away easily) without compromising its usability, then I would have found the perfect squat racks for me. My idea of squat racks that can be stored away easily are those that are freestanding and/or collapsible. By freestanding, that means they shouldn't be permanently attached to any support like walls or joists. And if they're dependent to a support, they should easily be disengaged, dismounted or separated from such support. Collapsible squat racks allow you to fold or dismantle the exercise equipment for easy transportation and storage. Anything that can be stored away should take as little footprint as possible when stored. What sense would it be to "store away" a squat rack or squat cage if it STILL occupies the same 5 feet square of space? That's my rack! I'm so happy to see it used in an article. Great to see you here, Rossi.